CONICET researchers participated in the global meeting for technology, science, innovation and entrepreneurship held at Tecnópolis. 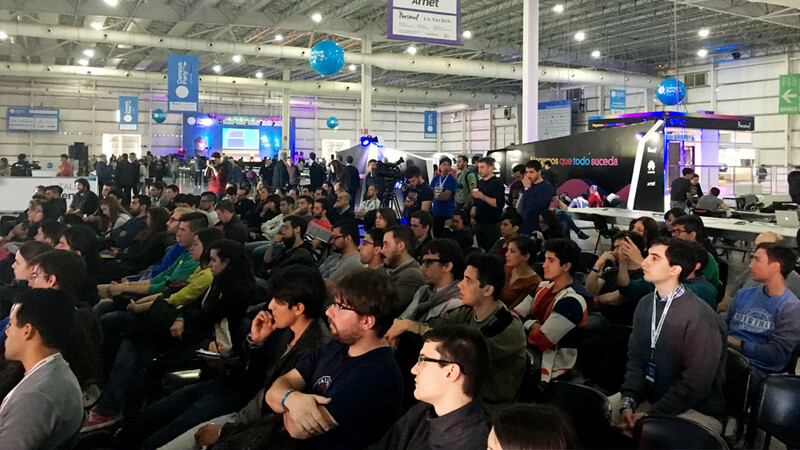 Campus Party Argentina. Photo: CONICET Photography. Nanotechnology- the science of small things- has been called “the industrial revolution of the 21st century.” For this reason, it played an important role at the Campus Party Argentina, a muldisciplinary meeting that gathered experts of different areas such as science, creativity, innovation, smart city, entrepreneurship and digital leisure. The meeting was led by two researchers who belong to the National Scientific and Technical Research Council (CONICET) and spoke about this science and its applications in everyday life. The two scientists are Galo Soler Illia, CONICET principal researcher at the Instituto de Nanosistemas of the la Universidad Nacional de San Martín, and Eugenio Otal, assistant researcher at the Unidad de Investigación y Desarrollo Estratégico para la Defensa (UNIDEF, CONICET-Ministerio de Defensa). “Despite not being aware of it, we are surrounded by nanotechnologies that modify our way of seeing the world. They came here to stay”, Galo Soler Illia stated. As he had explained, the nanotechnologies are the new technologies that have impact on our civilization and will influence our health, environment, energy and food in the following 200 years. This type of technology is based on the use of nanomaterials, which are tiny, with the nanometer: “This is a small unit of measure. When matter is reduced to this scale, there are new properties”, the researcher said and provided examples with the intensive properties of gold, such as the color, which changes according to its size. “Where can we find nanotechnology?”, Soller Illia asked, and indicated as examples products such as the pregnancy test, the catalytic converter, hard disks and Juan Martin del Potro’s tennis racquet, where the nanoparticles suppress the vibration enhancing force and direction. Thanks to nanotechnology it is possible to have self-cleaning cement that cuts pollution of the environment. Nanotechnology is also used in areas such as energy ( solar paths that do not cause ecological problems to load a cell phone, for instance); environment (to generate material to detect arsenic in water) and health (to develop a nanoparticle loaded with an antibody that travels through the bloodstream to heal a sick cell). He also commented that nanotechnology began to grow when it became visible through a scanning electron microscopy; and make a difference between nanoscience and nanotechnology: the former is about the way in which the material behaves, and the latter is about the manipulation of that material. Otal presented three relevant concepts of nanotechnology: functionality, manipulation and connectivity. He spoke about the incorporation of technology in the textile industry. The researcher refered to the initiatives that have been conducted to develop the quality of clothing. For instance, the Project Jacquard of Google will allow people to design clothes that can be connected with different devices to turn on lights and control the volume of the music being played, among other possibilities. “I can generate electricty inside cotton fibber, that is to say, to produce conductive fabric to load the phone in a dress”, states Otal, who is currently working with other two scientists in the project “Fun with flags”, to manipulate fabrics with variables such as light, temperature and humidity. The meeting was attend by other CONICET researchers: : Cristian García Bauza, with his talk charla “Virtualizando la realidad”, Juan Ignacio Giribet with this talk Drones: últimos avances de la tecnología”, Agustín Gualco and Sebastian Zappa with his talk “Aplicaciones de recargues nanoestructurados base Fe y de modernos aceros inoxidables”, Alejandro Nadra with “Biología sintética: bio-tecnología para tod@s”, Fabricio Ballarini with “Hackeando memorias, una experiencia educativa”, and Emiliano Gentile with “Makers en mundos mínimos: un recorrido desde la microbiología al bioarte”. Campus Party is one of the greatest technological experiences that has held more than fifty meetings in ten different countries since 1997. The Argentine edition covered topics related to current innovation such as Big Data, , ECommerce, Green Tech, Hardware & Modding, Mobile Apps, 3D Printing, Open Data and Wearable Tech. More than 35,000 people attended the meeting that lasted five days. There were more than 450 hours of activities, workshops, conferences, challenges, hackatones, business sessions and entertainment activities.